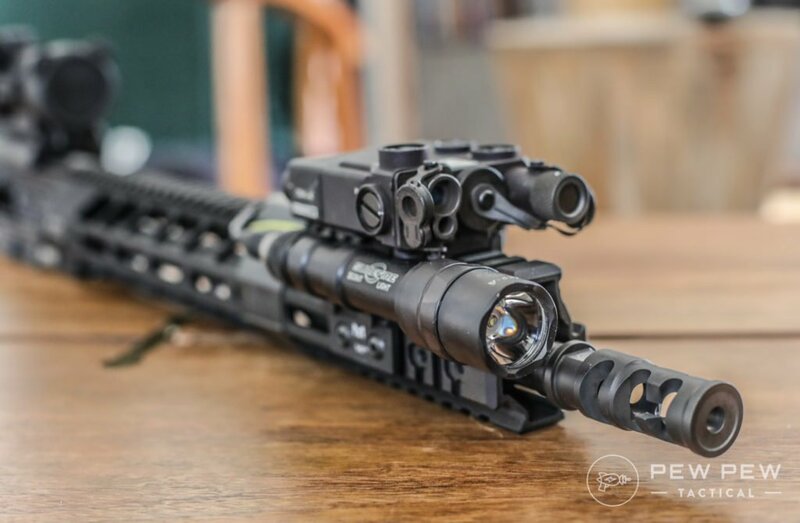 Want your AR-15 totally ready for low-light situations? 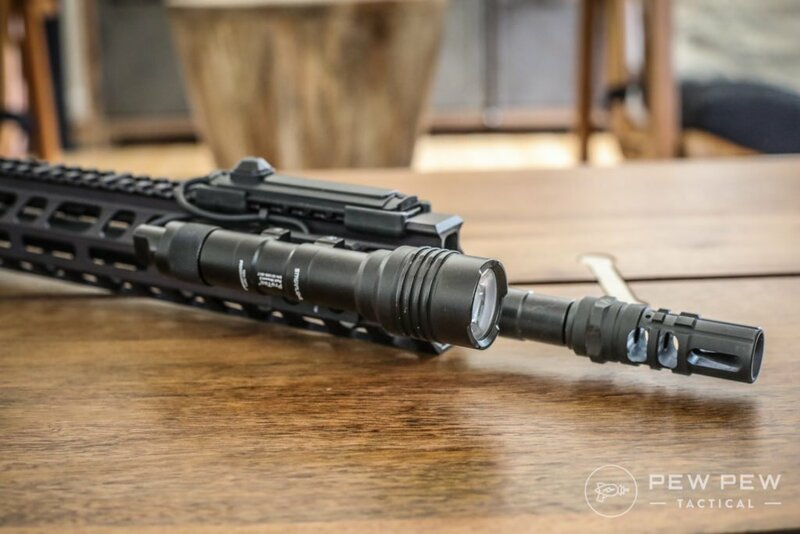 We’ll cover 5 of the most popular AR rifle-mounted flashlights…from $40 to $240. By the end you’ll know which is the best for your end-use and budget…plus the best positions, mounting methods, and usage tips. 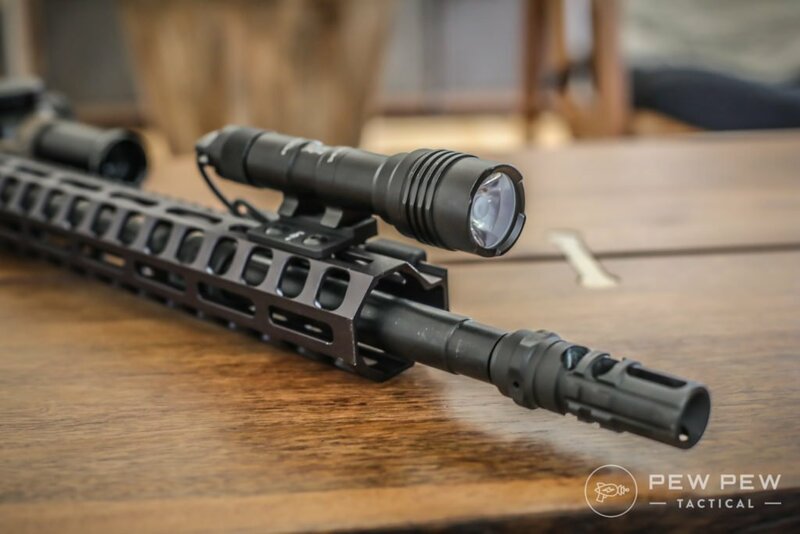 The SureFire M600 Scout is the gold standard of AR-15 lights. Chances are if someone is depending on their rifle for their job/life…they’re going to be running a SureFire. The Scout is ruggedly built and you can feel it in-hand. 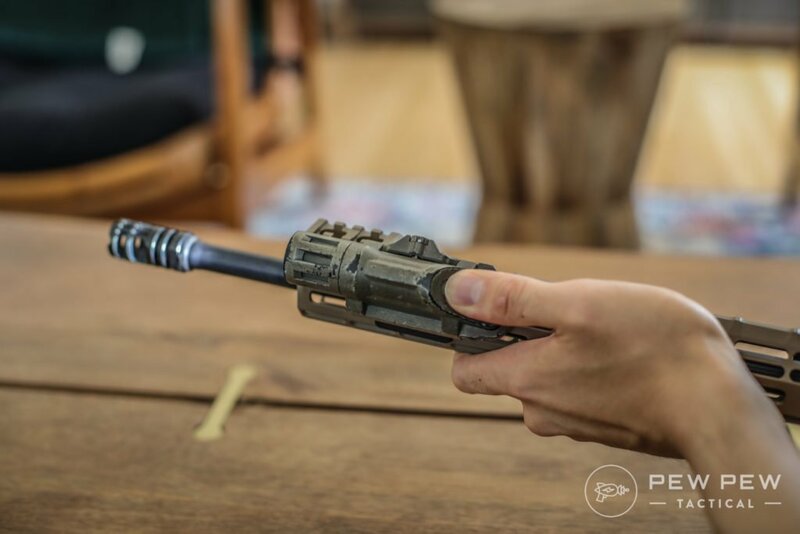 There’s a reason why people choose SureFire when it matters. Most regular packages come with only a rear push-button cap…which is fine if you know you’re going to be using a light and leave it on. I left it like that for a while for competitions. However, if you’re only looking for momentary-use…such as when clearing rooms…you’ll want to get a remote tape switch (UE07). I’m testing out a couple different ways of cable management…so far my favorite is the old-school cut up bike tire (12 x 1.5-2.25 above). It only comes in full power on or off…keeping it simple so you don’t have to fumble through different modes. First, it sits at my sweet point of rifle light brightness of around 500 lumens. Good for some distance outside…while not totally blinding if I’m using it indoors. Second, it has a very bright center beam that makes it easy to identify your primary target. Here is a test at around 25 yards. Even though it’s very bright in the center…you’re still able to see stuff in your peripheral. Color of the beam is also slightly warmer (yellow) when compared to the others. But it’s so subtle I could only tell when having them next to each other. Sorry…but it became really bright indoors with 5 lights on and I couldn’t get great pictures to show the difference. 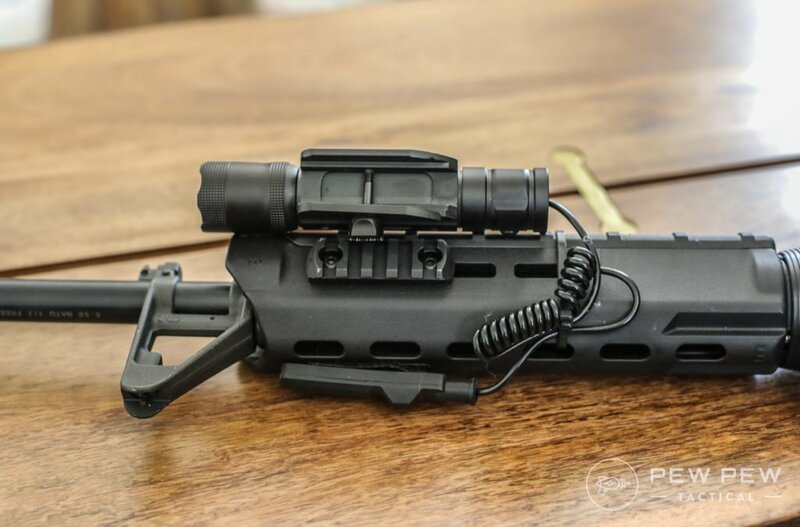 Out of the box it comes with a Picatinny rail mount…but Picatinny on the sides are going out of style for weight issues (Best AR-15 Handguards) and putting the light on the top rail gets in the way. 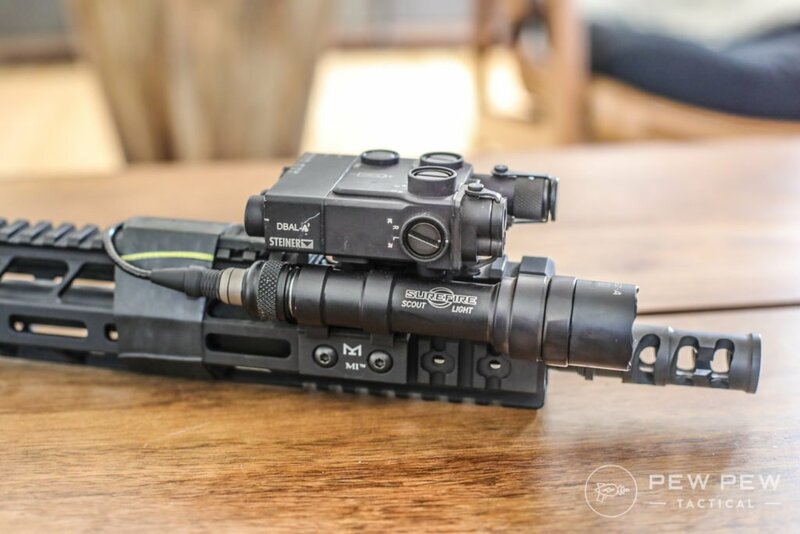 One option I’ve seen a lot is SureFire’s Offset Mount ($59) that goes on top of the Picatinny rail and moves the Scout to an angle. 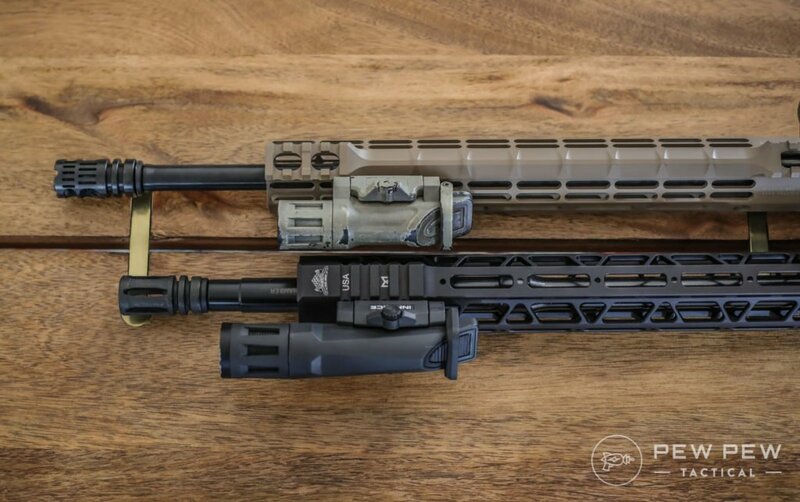 Good if you don’t mind using up some rail space or don’t have M-LOK. 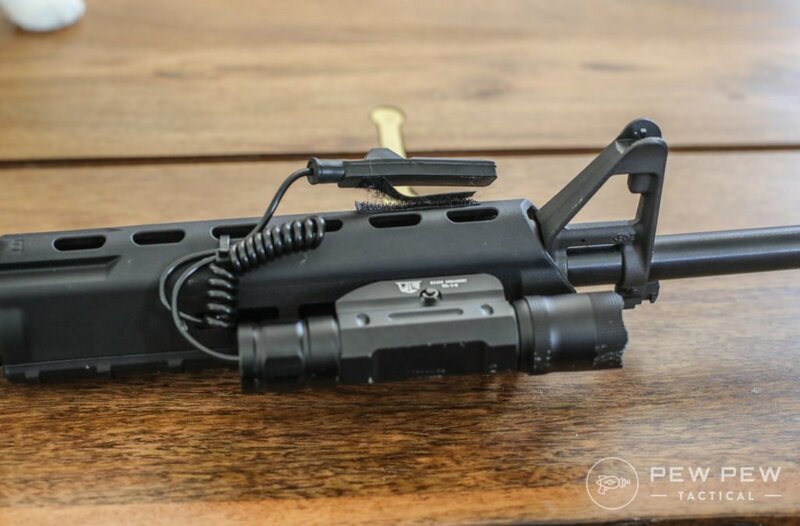 There’s also the option of the Midwest QD Mount ($62) if you’re wanting to move your light between different rifles. But it does add some extra height. 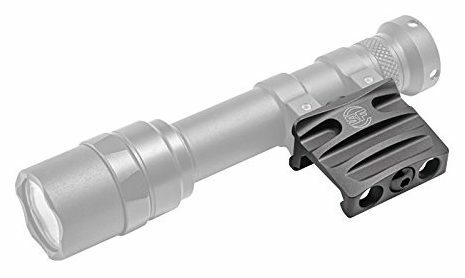 My current favorite is the Midwest Offset SureFire Mount ($39) for M-LOK handguards. Super slim and light…plus it brings it in close…but not so close that you can’t put other stuff on top like my IR laser/illuminator. It’s never failed to go on when I did my part with fresh batteries before extended use sessions. This one hasn’t been through intense abuse (yet) but I’m sure it will make it out alive. Get it if you want the best that pros throughout the world use. Just be prepared to get in that “buy once, cry once” mentality since you’ll likely want the remote tape switch (UEo7). What do you think of the M600 Scout if money were no object? There’s also the smaller version M300 that still produces 500 lumens. The mostly polymer Inforce WML is what I’ve been using the longest. Mine’s a Gen 1 so there’s been some updates in specs. 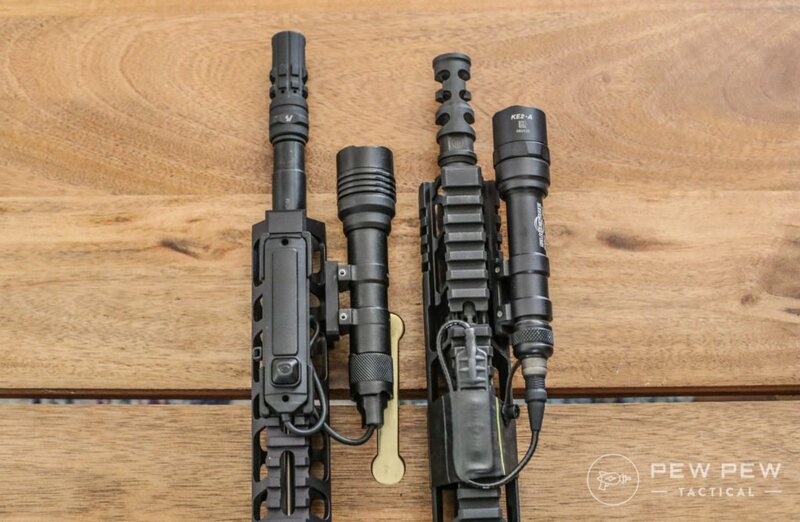 First thing you notice is that it’s different from other AR-15 specific flashlights that pretty much look like regular flashlights. It’s mostly polymer and only needs 1x CR123 battery which makes it lightweight. There’s some stories that if you really bang it hard against something…the metal vs polymer battle commences and the light breaks. I’ve used it pretty hard and it’s met some walls…so far so good. Plus it has an ergonomic activation button and two methods of preventing accidental use…a lever that comes up to physically block the switch and a head rotation lockout feature. No need to get a remote pressure pad! 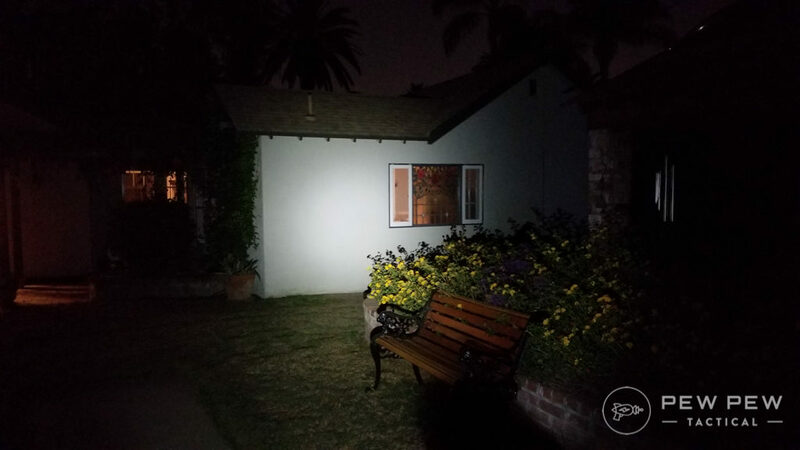 Keep in mind that mine is a Gen 1 with 200 lumens while the new Gen 2 has 400 lumens. It’s more spread out compared to the SureFire and a little cooler in color. Very usable and at 400 lumens still very bright and less blinding indoors. 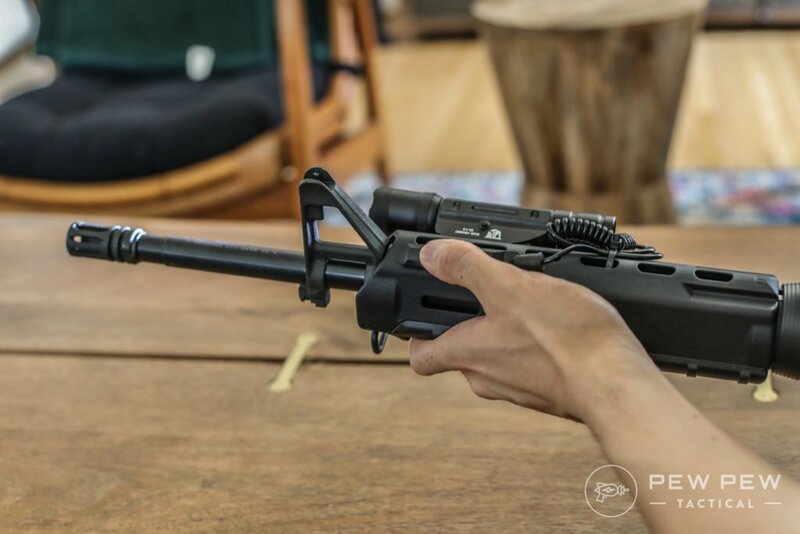 It comes with a built-in Picatinny mount with a thumbscrew. It’s never fallen off for me through thousands of rounds of 5.56. Though you can mount it on the top rail and still have an ergonomic grip…I like my lights offset. I’m digging the Magpul Offset Light Mount ($18)…affordable and held on great even though it’s polymer. My WML has been through a lot and has kept on ticking. I recommend it if you don’t like dealing with pressure pads and want to save a few ounces up front on your rifle. Boom! The big brother of the WML…the WMLx. You’ll notice that there’s mention of IR (infrared). This one is a dual light that can help you illuminate areas if you’re wearing night vision goggles (NVGs). However…there’s also a pure white light version that gets you 800 lumens. While the IR version gets you 700 lumens of white light and 400mw of IR. Everything else is pretty much the same…just bigger. It now has two batteries for more oomph and there’s a switch that lets you choose between white or IR if you have that model. 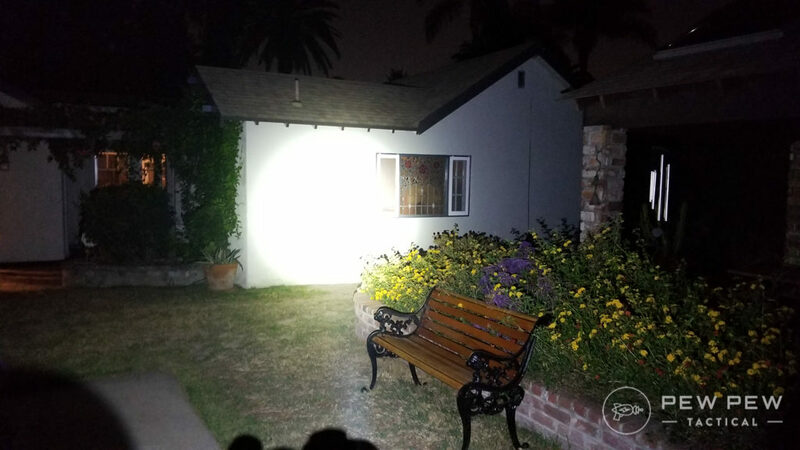 Here’s 700 lumens of white light…with a fairly concentrated center. Also a little cooler than the SureFire. 800 would be even more eye-searing if that’s your thing. 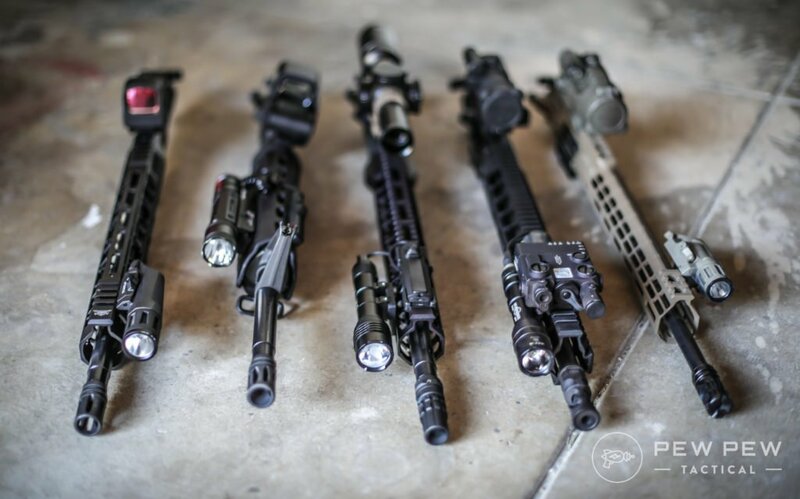 Now…how about night vision? Here’s what the IR does for you. You can tell the NVGs were struggling a little since there wasn’t much ambient light…but when the illuminator came on the details came with it. You can see the white light switch at the bottom as well as some scratches on the front metal portion. I haven’t used this WMLx as much since I got it for my NVG project. But it’s held up great like its little bro WML. 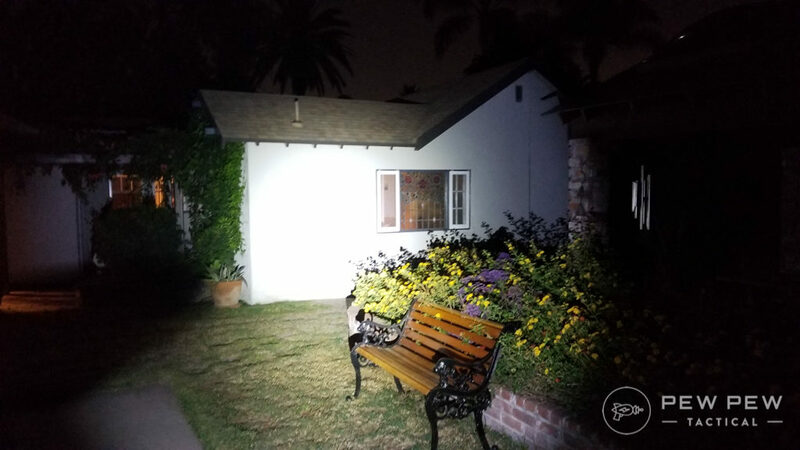 Highly recommend if you’re looking for more white light illumination with the regular 800 lumen model…or if you need wide IR illumination. 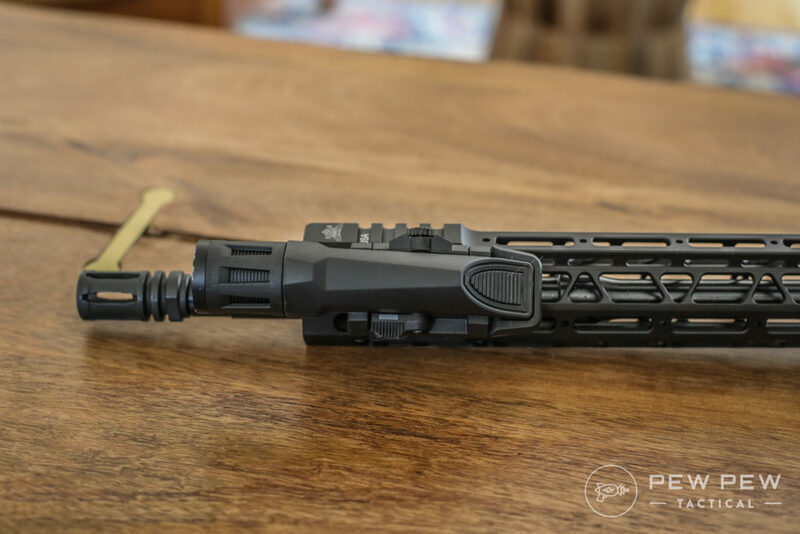 Our budget pick…the Ozark Rifle Light. 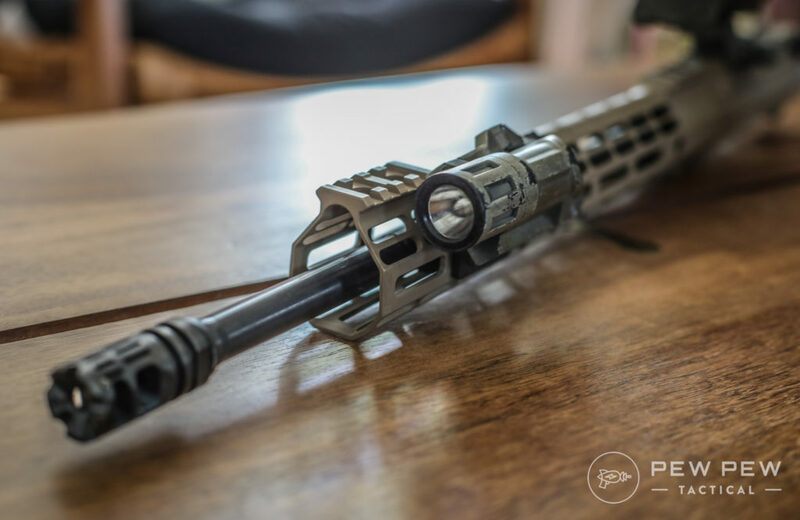 I chose this one based on the best reviews of a rifle mounted light under $50. And surprise cat feet! I abused it a little against walls and the ground…now it has scratches but it’s still chugging along! It comes with a Velcro mounted remote pressure pad that is a little tall and very spongy…but works. Rear-most button makes it stay on while the front is for momentary. It activates strobe function if pressed by itself…or if the light is already on…it will cycle through low, medium, and high output. I’ve definitely accidentally activated the strobe function when laying down the rifle. The other brightness options are nice to have…but in the end I’d rather have high on or off. A little more spread out of a center beam…but it’s plenty bright at 600 lumens and the coolest color (most blue) of the bunch. So far so good in terms of durability and light output. However…mounting is lacking. 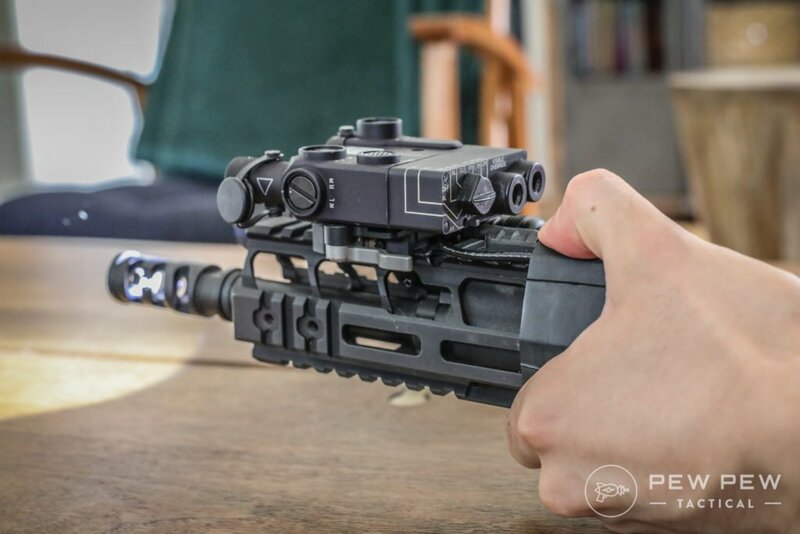 I had a Magpul Picatinny Rail ($6) section on my MOE handguard. But if you take a look carefully at the mount…there’s no lock bar that fits into the rail. It’s completely held on by tension/friction. Good news is that it’s held on for a couple hundred rounds of .223…but I probably would check each time I go to the range and also not go higher in caliber. Two trips to the range and it’s already falling off. Plus the cord is so long you can probably mount it on your buttstock. Good thing it comes with a push-button end cap…I’m going to swap it out for that. 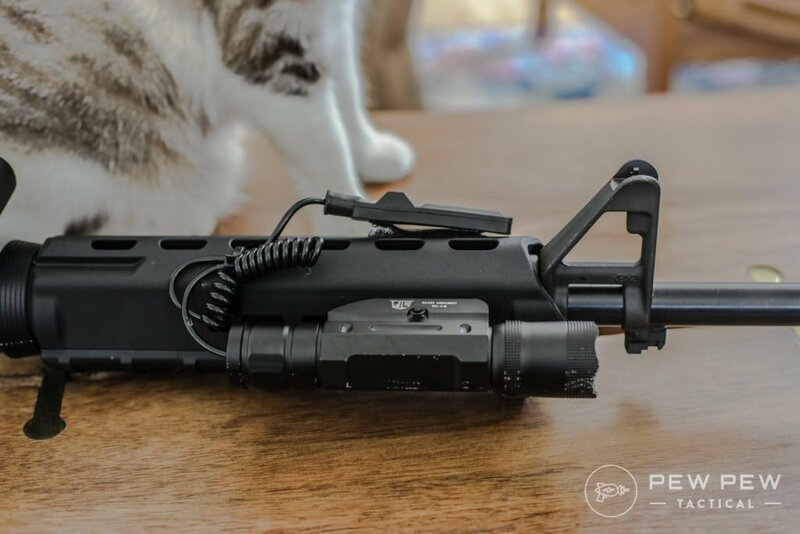 The light itself is robust so far…but the mounting, pressure pad, and weird strobe button stop me and my derpy cat from fully recommending it. 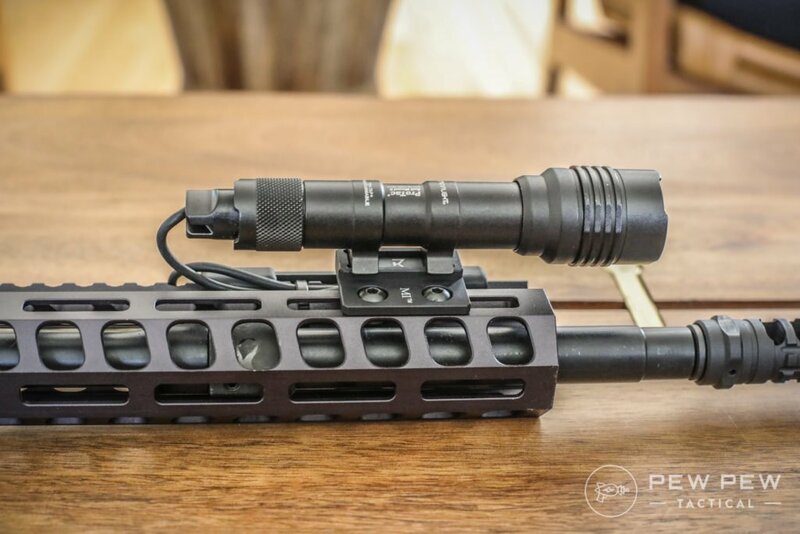 From my favorite best bang-for-the-buck light company (like in Best Pistol Lights)…the ProTac Rail Mount 2. Feels quality in hand…and if it’s like my pistol lights…will survive for many years of use. First thing…is that it comes with LOTS of goodies. There’s a Picatinny mount, remote pressure pad, two ways to attach the pressure pad (double-sided tape or rail mounted inserts), regular endcap, and zip ties for cable management. The pressure pad is also very nice quality and has a higher button for constant on. 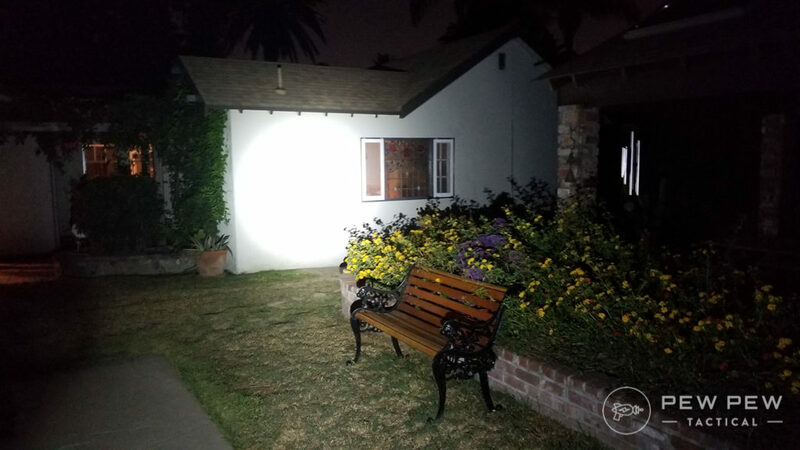 Also similar in lumens with 625 (I feel they just had to beat them a little bit). 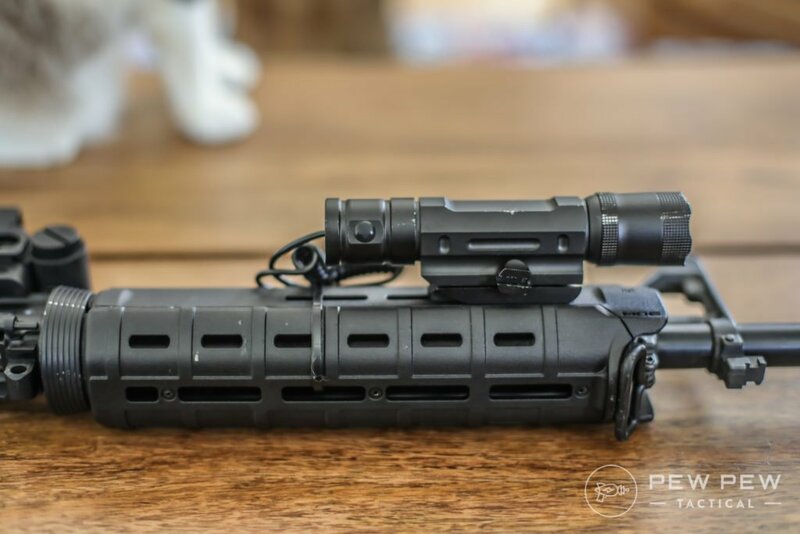 Very powerful center beam that’s just a tad bit cooler than the SureFire. I’m only able to tell when they were next to each other indoors. It comes stock with High and Strobe (double-click) function, but you can reprogram it to be other options (search for Ten Tap). I’ve set mine to High only. 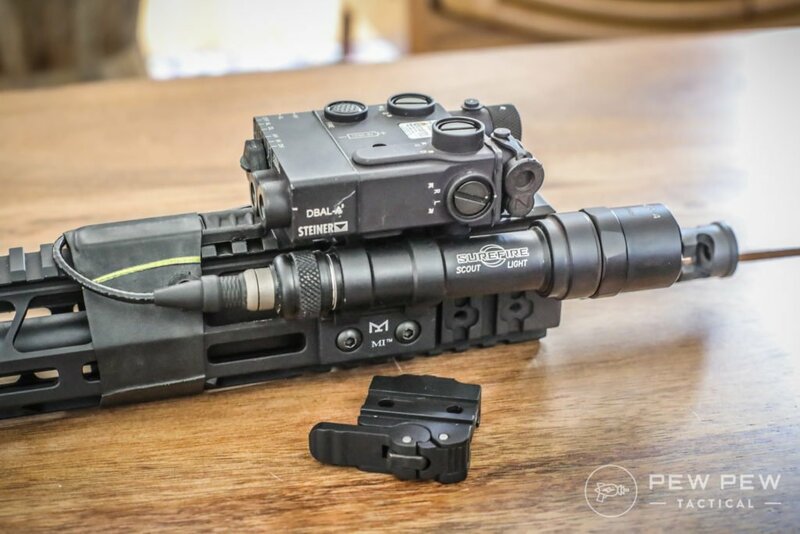 One very cool thing…the ProTac 2 has the same footprint as the M600. 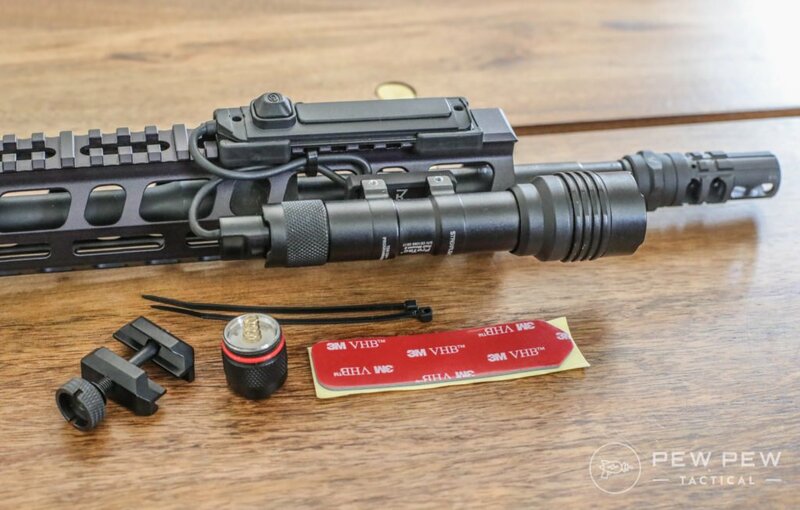 That means all the mounts you use with the SureFire work with the Streamlight. This one is rocking the straight version of the Midwest Industries Mount. I still like the offset version since it brings in the light closer. I’d only get the straight if you have a large device that might get in the way on the top rail. One complaint is that the rail mounted attachment for the pressure pad is a little oversized so it lets the pad move about a quarter-inch. Maybe I’m being nit-picky but I’m probably going to swap it out for the bike tire method. This is the light for almost everybody. Worth-it price, great beam, lots of accessories, and a history of stuff that works/lasts. Your gun points where your light is pointing…remember your safety rules! 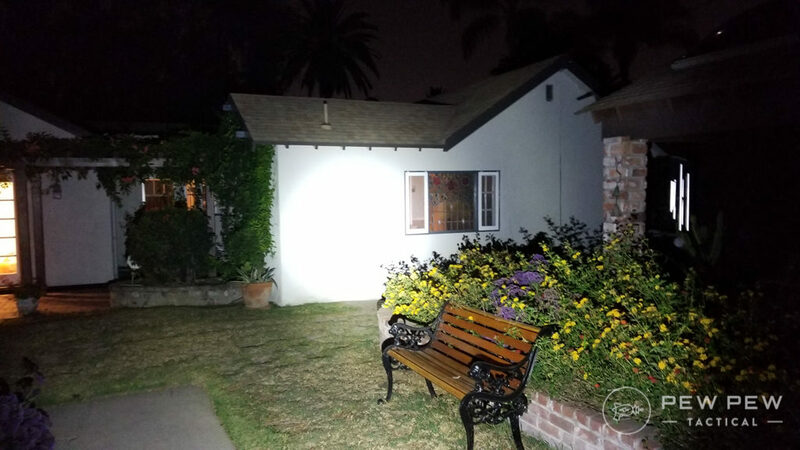 If you’re using your light in a safety situation…try to only turn it on when needed. It can give away your position. That’s why I like having pressure pads or the Inforce for serious guns. Keep your wires away from the gas block…it’s going to melt sooner or later. If you’re shooting during the day…put some tape on the lens to avoid carbon buildup. And the best lens cleaner is a rubber pencil eraser. Our overall Editor’s Pick if you want the best and have the budget…is the SureFire M600. Also be sure to check out Inforce for something lighter and doesn’t require a pressure switch. 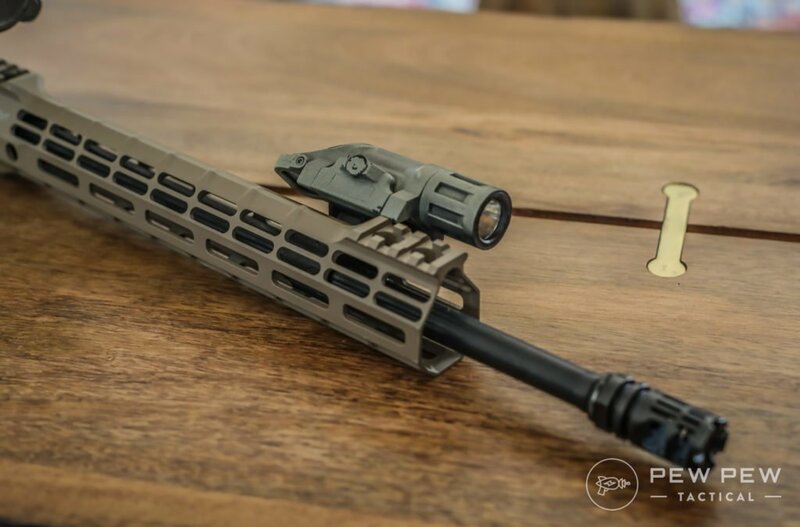 While our Best Bang-For-The-Buck goes to the Streamlight ProTac Rail Mount 2. 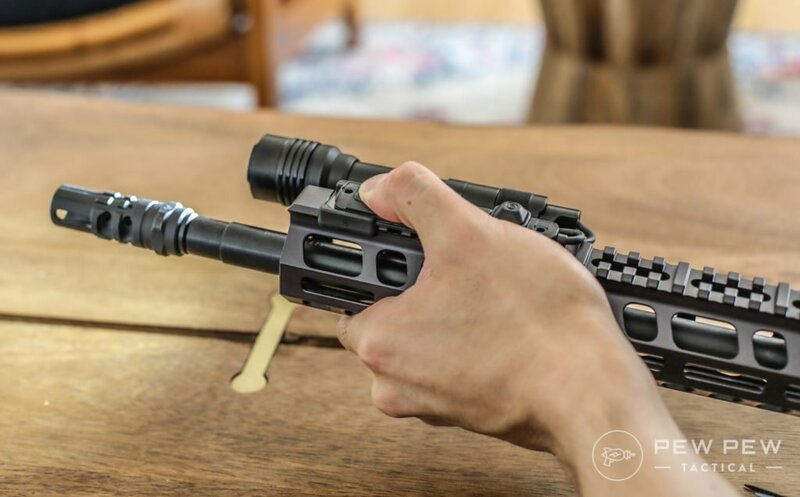 Now that your AR is outfitted with a light…how about getting yourself (Best Tactical Flashlight)…or your pistol (Best Pistol Lights)? And to keep those lights fed…make sure to have a good supply of CR123 Batteries. 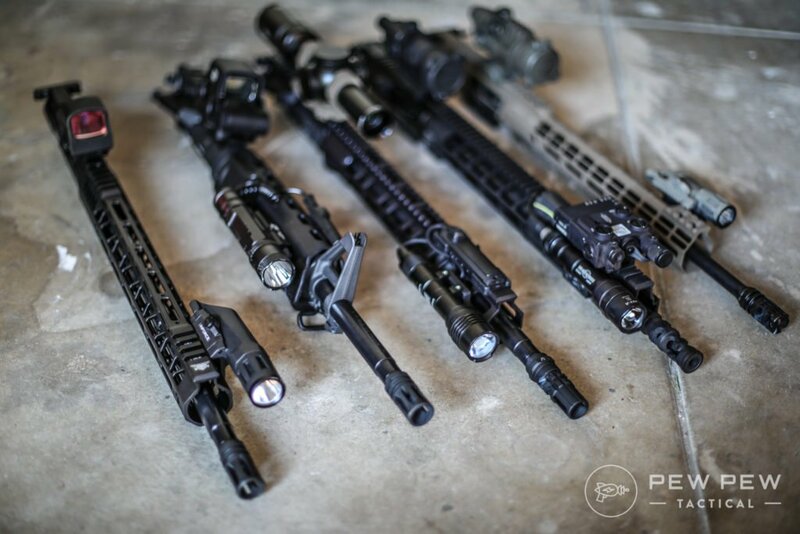 How did we do in our Best AR-15 Flashlights list? Anything we missed and should add for next time? Or any tips for beginners? Not into tactical or competition use myself, just hunting. Recently purchased a Nitecore P30 Hunting Kit. Serious throw light for its size, uses single 18650. 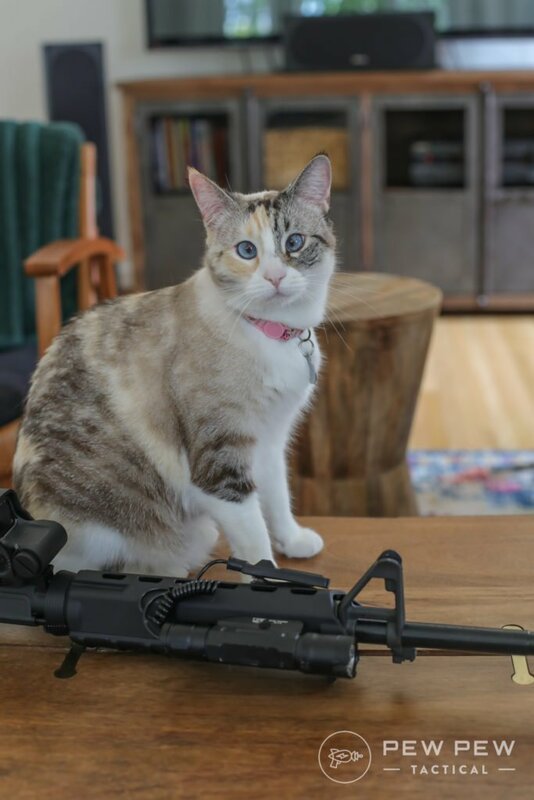 Kit comes with red/green filters, scope barrel and offset picatinny mounts, tail cap remote switch, 2-bay charger, and a single 2300mAh battery. Used a Kinetic Development MLOK QD mount to pop it on/off the hand guard. 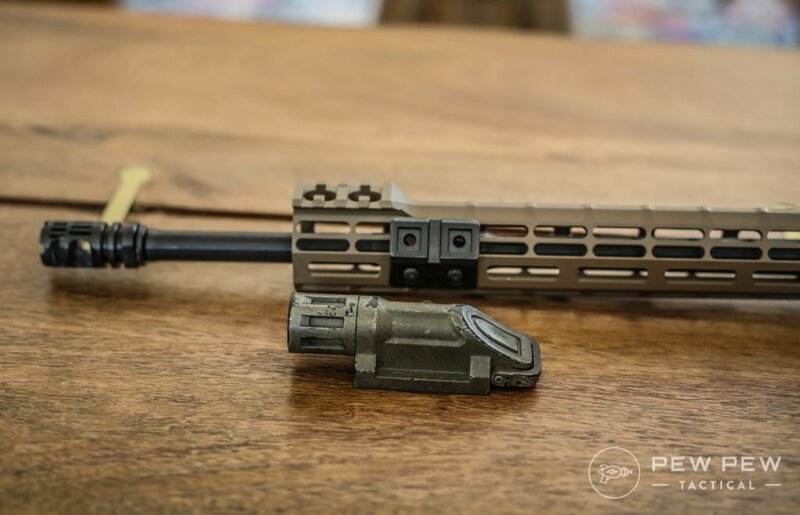 Too bulky for the uses you’re talking about but man it will light up a pig at night +50yds downrange. I personally have been a huge fan of Olight for years. 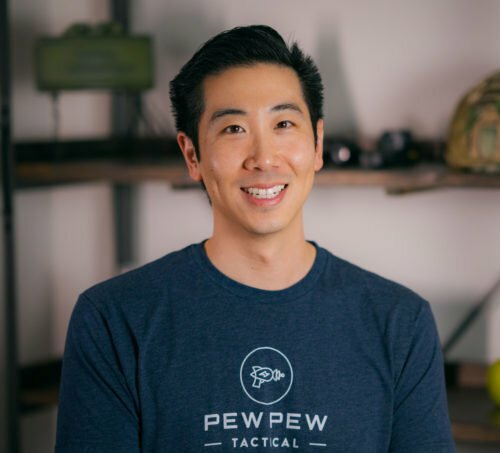 I’m in the military and have been consistently spending more and more money on their products because they are very well made products! 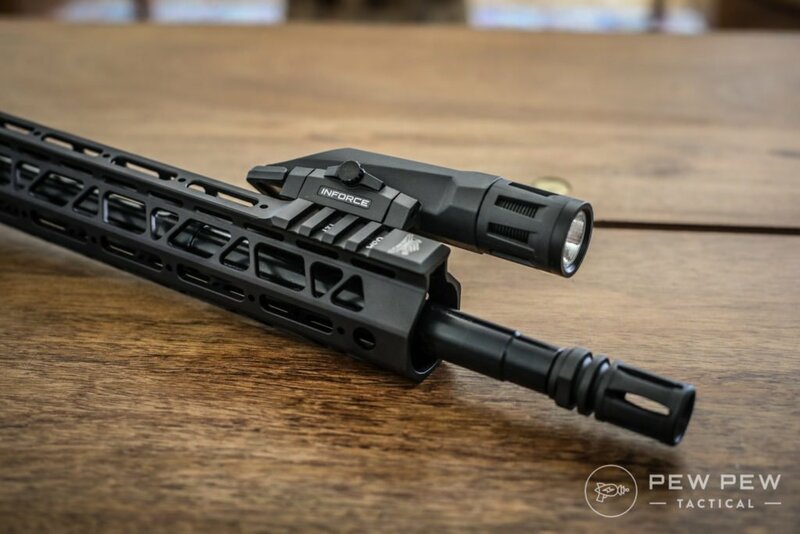 I have the Olight PL-1 Valkyrie mounted on my Remington 870 and my custom built AR pistol in .223 Wylde. For $60 you get a 450 lumen flashlight coming standard with a Picatinny rail using (1) CR123A…and it’s waterproof! Even a 5 year warranty. For $60 you can’t really get much better than that. Worth it to check it out. Informative article, with interesting choices. 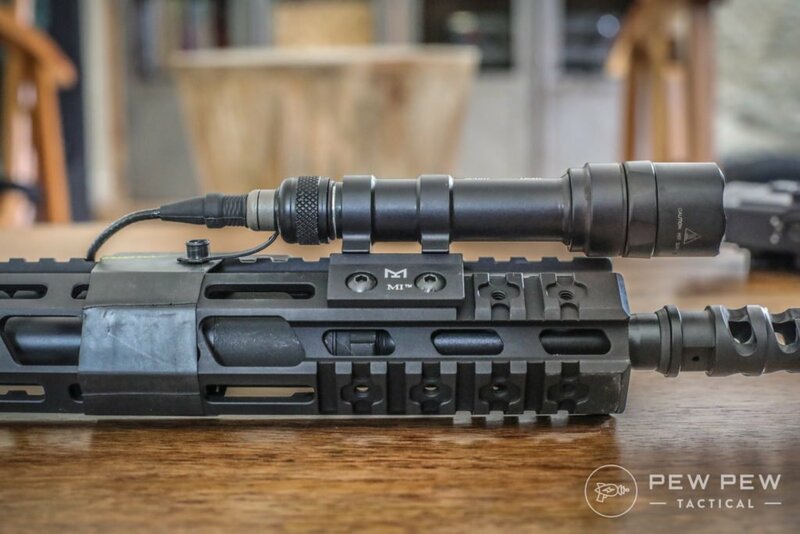 Personally, I have great things to say about the surefire 600 and it has last me years. It is expensive so buy once cry once right? I would also take a good look at Arisaka’s 600 series, it’s easier on the wallet & interchangeable with surefire mounts/switches. Thanks Alfredo! Haven’t heard of Arisaka but I’ll try to get them for the update.